June is back-to-school time for many students in our beloved Philippines. It is the season for last-minute shopping spree for school supplies. Even though I am not a schoolboy anymore, I still buy these supplies for my work- and leisure-related activities. Now, I will show notebooks that made me admire the manufacturer, Advance Paper Corporation. Considering that the our republic is commemorating Independence Day on June 12, Advance Paper's release of the Pinoy Pride series of notebooks is very commendable. The front cover of the notebook comes in various designs, some of which are shown above. The one in left features the hero Andres Bonifacio. It contains the text, "BILIB AKO KAY ANDRES BONIFACIO" with the "BONI" portion of his surname highlighted. The design in the middle has a Baguio tribal chieftain riding a Harley-Davidson. The text reads "ONE COOL TRIBE" with "GO BAGUIO GO!" in a smaller font size. The rightmost design depicts a Philippine map made of hearts, apparently showcasing love of our country. 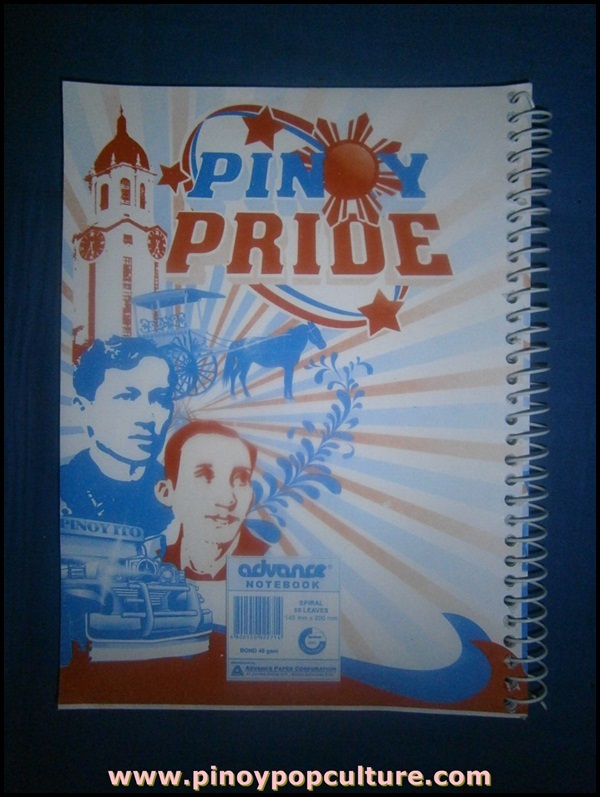 The notebooks have a similar back cover: A collage that includes images of the Manila City Hall clock tower, a calesa, Jose Rizal, Apolinario Mabini, and a jeepney having a sign that reads "PINOY ITO." In a time that the Internet offers a seemingly endless plethora of pop culture distractions, the notebooks give hope that the youth will be reminded to become proud of their Filipino heritage. Manufacturers of other products used in daily living could follow the example of Advance Paper.